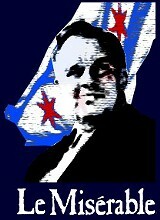 It's a shame people are harshing on Mayor Daley for his passionate support of the Children's Museum. His love for the children, and the poor, and the poor children, is boundless. And all he wants to do is express his love in the form of a museum, and the Javerts who live next to Grant Park want to put it far away from the poor children, like all the way on the south side. Or something. It makes me so sad that I want to break into song.